We are back into the green of Trinity-tide this Sunday as we continue on our journey through the teachings of Jesus. This Sunday’s lessons remind us not to be anxious about what we are to eat, and what to drink or to wear. But what about the recent proposals for redevelopment in our neighborhood? I know that many of us are anxious to see what may happen. After the 8:00 and 10:00 AM services today the sketches for the proposed development in our immediate area will be available to see. We had them on display last Friday and last Sunday, and they have generated much discussion about what the future may hold. I used to have a regular monthly lunch with some area clergy and a clergy/church consultant named Kirk Kirlin. We would share and discuss our hopes and concerns in ministry. Of all those conversations I remember one most poignantly. After a few of us discussed some things we were struggling with, one said that his fear was that he was unsure of what the result would be. Kirk opened our eyes, and hearts, by reminding us that in life the result of most things ARE unsure. We like to have the illusion of being in control, and even that we can control all of our destinies. But the reality is that there are many factors that can derail the best laid plans. All one can do is do one’s best, be diligent and faithful, and trust that God has the best in mind for us in the big picture. The vestry and leadership of this parish is certainly being diligent as we discern how to be faithful in what God would have us do with the proposal given to us by Olympia Development. And we understand that there is anxiety in the unknown of what these projects will ultimately look like, how it will feel having buildings in such close proximity, as well as how it will impact the parish in the coming months and years. On Thursday I was at the ground-breaking ceremony for the new Red Wings hockey arena. The big project is under way! By next spring work will begin on our side of the freeway as well. Apartments, retail space, office space, and parking decks are being erected in the parking lots in front of Comerica Park and in the small lot between the Fox Theatre and the Fillmore Theatre. The changes will begin to happen all around us, and the portion they are asking us to participate in is only a small part of their project. This much change can certainly be scary. What will it be like to have buildings so close to the church again after 40 years without? How will it impact traffic? How will it impact scheduling of events on Saturdays and weekday evenings with games and concerts happening at the new arena? What will it be like during the construction? At this time we are working with Olympia in trying to find as many answers to these questions as possible, and more. As Bruce Burton mentioned at the Friday parish meeting, we want to hear your concerns and ideas. One person’s suggestion made at the meeting has already been added to our list of needs; planning to make the church directly handicapped accessible through the side garden church door as a part of the new landscaping plan. Other suggestions are now being collected to give to the committee and to be given to Olympia Development. I promise you that we will be diligent in preparation, and I hope you will join us in being faithful in prayer as we sort this all out, knowing that nothing about the future is certain. We will agree to nothing unless we earnestly believe it furthers and supports St. John’s mission to Know Christ and to make Him known! On Friday we had a special parish dinner and meeting, at which were discussed important topics such as new initiatives for outreach, the various ministries of the parish internally, and the sharing of updates on the proposed development of our neighborhood, including the possibility of the building of an apartment building on a portion of our parking lot. As I write this column, that meeting has not occurred yet. But one thing that I want to share here is the new logo, designed by Ms. Jennifer Dunn. Jennifer, who works in Senior Warden Bruce Burton’s office, used the existing and well loved line sketch of the church, and superimposed a motto for the work of the coming years, Renew Detroit. It is a wonderful reality that St. John’s sits in the middle of the renewal of Detroit. Begun 14 years ago with the building of Comerica Park and Ford Field, but stalled by the recession, we now see the neighborhood being renewed and developed further in exciting ways. But for us, Renew Detroit means more than arenas, apartments, retail, and rail-lines. St. John’s is poised for a more important renewal – the renewal of the heart and soul of Detroit through faith in Jesus Christ! Ultimately our existence is for this mission: to know Christ and to make Him known. Our worship and ministry is geared to this renewal, beginning with the deepening of our own faith, and just as importantly the sharing of it to bring others into a relationship with Jesus. It is a new logo, but it is the original mission of the parish. Renew Detroit that all may know that Jesus Christ is Lord! We adore thee O Christ, and we bless thee; because by thy Holy Cross thou hast redeemed the world. Today is not only Sunday, it is also The Exaltation of the Holy Cross (September 14). This Feast day goes back to the year 335, when the church built over the place of our Lord’s Crucifixion and His Resurrection was dedicated on this date in that year. The empress Helena, mother of Roman Emperor Constantine, directed the excavations of the site, buried when the Roman City of Aelia Capitolina was built over the ruins of Jerusalem. During that excavation what was believed to be the true Cross was believed to be found. But more important than that holy place and holy object is the reality of why that Cross was holy! It is holy because upon it was hanged the body of our Lord and Saviour Jesus Christ. Upon that Cross Jesus bled and died not as a criminal or one unjustly condemned, but to pay the price for our sins, the propitiation, the atonement, that frees us from eternal death! As by the tree Adam transgressed and we inherited that original sin, so by this tree (the Cross) we are justified by Jesus! It is said that St. Bonaventure, the great Franciscan Theologian, spent more time meditating on a crucifix (Cross with a representation of the Body of Jesus on it) then he did reading and writing, because the cross was his inspiration for that writing. And although we have mostly sanitized the idea of a cross by making it of pretty metals and wearing it as jewelry, it is to our advantage to spend time meditating upon its crude, rough hewn reality, and to think of how Jesus died upon it to pay the price for our (for MY) sins. Let us look with love upon the cross, and thank God for his sacrifice made for us, and for the whole world! This morning we hear of the healing of the man who was deaf, and had an impediment of speech. Jesus performs the healing with the command Ephphatha, which means “be opened”. This reading, and that phrase, holds a special place in the heart of St. John’s. 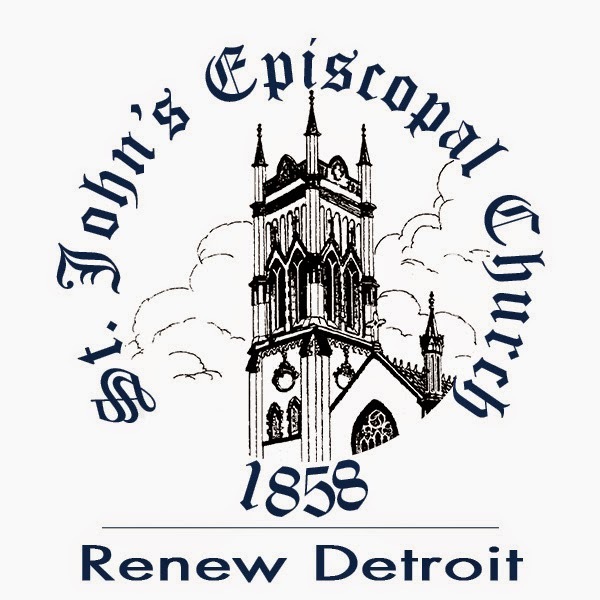 For over 100 years St. John’s was the host of the Ephphratha Episcopal Mission of Detroit. According an article in the February 1919 edition of the magazine “The Silent Worker: a magazine for the deaf by the deaf” the mission to the deaf at St. John’s began in 1877. Originally meeting at Grace Church on Jefferson (now closed), by summer of 1877 the mission moved to St. John’s, and continued her ministry here until the 1970’s. By the 1920’s St. John’s had seven Sunday Services, two of which were held in sign language. At 11am while the rest of the congregation worshipped in the main sanctuary the Ephphratha Mission worshiped in the chapel. In the afternoon there was also a 3pm Evening Prayer service. Many of the staff and members were graduates of the Michigan School for the Deaf in Flint, which continues to this day. By the 1970s the mission congregation’s size had dwindled, and those few remaining members attended the larger congregational service with a sign language interpreter. In 2001 the last remaining member of the congregation, Elizabeth Prescont Weber Walker, died She had been wife and granddaughter of two of St. John’s Senior Wardens. Although Summer doesn’t official end until September 21, for most of the United States this weekend signals an end of the season. Memorial Day Weekend and Labor Day Weekend frame the summer for us, and particularly this weekend since by law Michigan public schools cannot begin classes before the Tuesday after Labor Day. Even though we may not be in school, the ‘academic year’ frames much of what we do when it comes to scheduling for vacations, social events, and church programing. We will be easing into our programing year over the next several weeks. The Choir returns to full strength next week (September 7). On September 14 we will begin our newly revitalized Sunday School programing, with the children arriving by 10am and beginning immediately in the Undercroft. The following week, September 21, will be the beginning of our Adult Education series, which will still take place on Sundays at 9:05am. Other things coming up to speed in September include a meeting of the St. John’s Historical Society on the 14th, and a Social Fellowship outing for the families of Sunday School students to The Garden Bowl also on the 14th. A special event for September will be a special Parish Dinner and Discussion on FRIDAY, SEPTEMBER 19, beginning at 6:30 pm. In addition to a time of food and fellowship, we will discuss parish ministries, outreach opportunities, and the proposed changes around the neighborhood by Olympia Development. PLEASE RSVP today so we can make sure there is enough food available. And of course, we offer a prayer this weekend for Labor and Industry; for those who work and those who provide work, remembering that we are interconnected, and that all that we do (or can do) is a gift of God. Nothing that we do can be of any real worth if we do not have Jesus Christ at the center of it, and it ultimately contributes to the building up of the Kingdom of God.